Plan that will replace heavily altered three-story 1894 structure close to being approved; Commissioners asked to see some revisions. 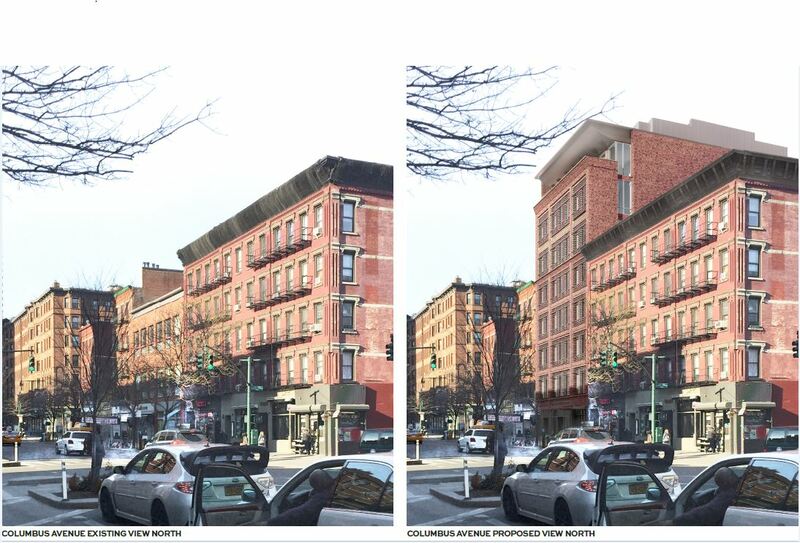 On July 19, 2016, Landmarks considered a proposal to redevelop a lot at 466 Columbus Avenue in the Upper West Side/Central Park West Historic District. The site is occupied by a commercial building constructed in 1894. The building was altered in 1961, and a third story added. Further alterations designed by Gruzen Samton were approved by Landmarks in 2006. The applicants proposed to demolish the existing building and erect a new residential structure with a commercial base. The Roe Corporation owns the site and will be the developers. Architects Harry Kendall and Todd Poisson of the firm BKSK presented the proposal. Kendall conceded that Roe proposed to build a substantially taller building than the one currently occupying the site, but argued that the plan was of a similar scale to other buildings on Columbus Avenue, and further, that the district was defined by its mixed typologies of residential buildings. Kendall stated that the existing building had been severely altered to serve many different purposes throughout its history, and was a “notably different animal” than the other buildings on the block. The eighth story would be set back from the streetwall, with a painted-metal cornice extending above to the same plane as the lower stories. Projecting cornices are a common feature of the district’s historic architecture, as are the strong delineations of the base, middle and cap that would be present in the proposed building. Rooftop mechanical equipment would be partially visible over the sidewalls. The building’s first floor would have a storefront of metal and glass with a granite base. Poisson noted that the floor area of the proposed building was far less than what was available under the lot’s zoning. Landmarks Chair Meenakshi Srinivasan stated that Community Board 7 had recommended that the applicants reevaluate the streetwall height of the proposal. Chair Srinivasan opened commissioner comments by addressing the threshold issue of demolition. Srinivasan said she supported the appropriateness of the existing building’s demolition, to which the other commissioners concurred. Srinivasan further noted that Columbus Avenue was a high-density thoroughfare, and that that proposed massing could be suitable for the site. Commissioner Adi Shamir-Baron found the plan generally approvable, while questioning some design details. Shamir-Baron thought that the masonry of the facade should extend through the building’s storefront at the base, and expressed reservations about the cornice. Commissioner Fred Bland said that the proposal exhibited a “sophisticated understanding of the streetscape” and praised it for using the historic materials of the district in a “completely new and interesting way.” Commissioner Michael Goldblum said that the plan would be a “better fit” if it were a “little lower.” Commissioner Jeanne Lutfy also thought the plan was slightly too tall as proposed. Chair Srinivasan asked the applicants to return to the Commission one more time before voting on the proposal, though the application was “close to approvable.” She asked them to present the Commission with a rendering of the project with lower floor-heights, and to further refine their plans for the storefront and cornice. LPC: 466-468 Columbus Avenue, Manhattan (18-4172) (July 19, 2016) (Architects: BKSK Architects).